In July 1831, Cyrus McCormick’s invention, the first successful mechanical reaper, was demonstrated in one of McCormick’s wheat fields. The reaper, which harvested grain five times faster with much less effort than a man with a scythe or sickle, was a revolution in agriculture. The reaper was the first of many mechanical inventions that allowed farmers to cultivate ever larger acreage with fewer people, which accelerated westward expansion. McCormick later moved his operation to Chicago and his company evolved into International Harvester and J.I. Case, now known as IHC or Case IH. Cyrus Hall McCormick (1809-1884) was born at the family farm, Walnut Grove, in Rockbridge County, Virginia on February 15, 1809. His father Robert experimented with a design for a mechanical reaper from around the time of Cyrus’ birth. In 1831, he abandoned the idea and turned the work over to his son. 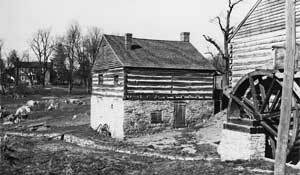 Cyrus made several changes to his father’s design and successfully demonstrated his reaper at Steele’s Tavern, not far from the family farm, in July of 1831. McCormick walked behind the reaper, which was drawn by a single horse ridden by a boy. Jo Anderson, a slave, raked the platform clear of cut grain. After a few additional modifications, Cyrus patented the invention in 1834. 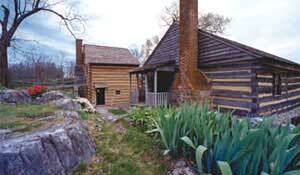 During the 1840s, Cyrus and his family manufactured and sold reapers from the blacksmith shop at Walnut Grove. Cyrus also made several trips to the Midwest, demonstrating his reaper and attempting to contract with local manufacturers. By the end of 1846, however, he had sold fewer than 100 machines. In 1847, he moved to Chicago and formed what eventually became known as the McCormick Harvesting Machine Company. There, McCormick developed innovative marketing and distribution techniques that helped make his company a success. He also benefited from the growth of Chicago as an industrial center and rail hub. By 1858, the company was the largest farm equipment manufacturer in the United States, with assets totaling over one million dollars. In January 1858, McCormick married Nettie Fowler, and began to spend more time away from Chicago. He also became more active in Presbyterian causes and Democratic politics. In 1859, he formed a partnership with his brothers William and Leander to form C.H. McCormick & Bros. William handled the company’s finances and Leander oversaw manufacturing. In 1871, the company’s factory was completely destroyed in the great Chicago Fire. McCormick built a new factory with increased capacity and began to pursue overseas markets in earnest. By the early 1880s, the company had expanded into markets as far away as Russia and New Zealand. The wire binder was followed in 1881 by a machine which used twine to tie the grain. Cyrus Hall McCormick died on May 13, 1884. His son, Cyrus Jr., became president of the McCormick Harvesting Machine Company. Throughout the 1880s and 1890s, the company retained its position as the leading agricultural equipment manufacturer. However, it found itself increasingly challenged by competitors in a somewhat depressed market. The company’s chief rival was the Deering Harvester Company. By 1900, McCormick and Deering were nearly equal in sales and worthy competitors. In 1902, the two companies merged to form the International Harvester Company. Three other rivals joined the merger: the Plano Manufacturing Company, the Milwaukee Harvester Company, and Warder, Bushnell and Glessner. Cyrus McCormick’s sons, Cyrus, Jr. and Harold Fowler McCormick, presided over the new company during its first 40 years. The workshop-grist mill area of the McCormick farm has been designated a national historical landmark by the National Park Service of the U.S. Department of Interior. The Walnut Grove Farm stayed in the McCormick family until 1954, when 634-acre farm was donated to Virginia Polytechnic Institute and State University (Virginia Tech). Research on livestock forage systems, livestock nutrition, and integrated pest management techniques for fruit orchards is now conducted at the farm. A multi-agency gypsy moth suppression program uses the center as a home base, and other special educational events are held there, including a recent summer geography teacher’s workshop held by the National Geographic Society. Over 7,000 visitors a year to Walnut Grove can find a restored blacksmith shop, gristmill and museum open to the public and a look at McCormick the man and his invention. Visitors touring this national historic landmark can see a full-sized model of the horse-drawn reaper 22-year-old McCormick invented with the help of his father, Robert. You can also see a dozen scale models of later versions of the reaper and, in the blacksmith shop, the actual bellows that Robert McCormick invented. To reach the McCormick Farm, take Exit 205 off I-81 at Raphine onto Rt. 606. The farm is approximately one mile east of the interstate. For additional information, visit the site. McCormick-International Harvester Company Collection at the Wisconsin Historical Society. Pretty Packages, a story about how Virginia Tech is sharing important pieces of history that came to the university as gifts. McCormick Invented Reaper 150 Years Ago – Learn more about the McCormick harvester and twine binder and view excerpts of the patent grant from the U.S. Patent Office to Cyrus Hall McCormick for his reaper, patented June 21, 1834.